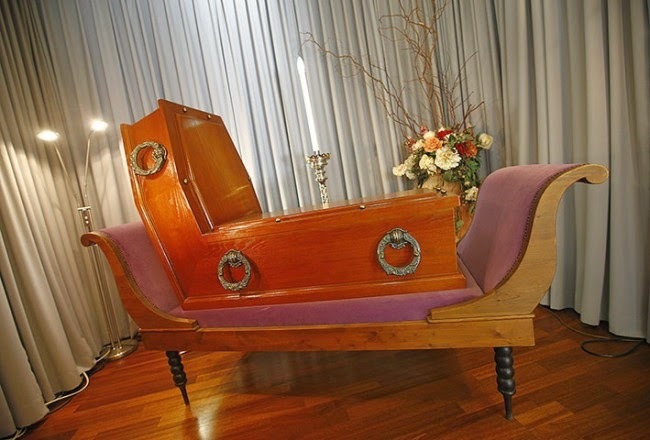 I'm finishing up my death and dying trifecta with a look at strange coffins. Yesterday it was intriguing trends in cremation practices followed by bizarre urns. I promised the odd urns would be my last foray into this topic. I lied. So kill me -- you have plenty of burial options to choose from here. 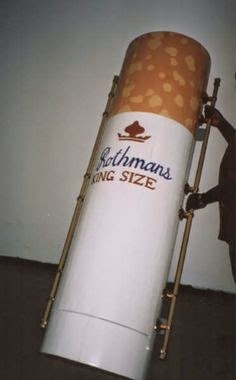 Here's a casket for the person whose dying request is "one last cigarette." It may also be for the tobacco company executive who has died of lung cancer but always insisted that cigarettes were basically a health food. 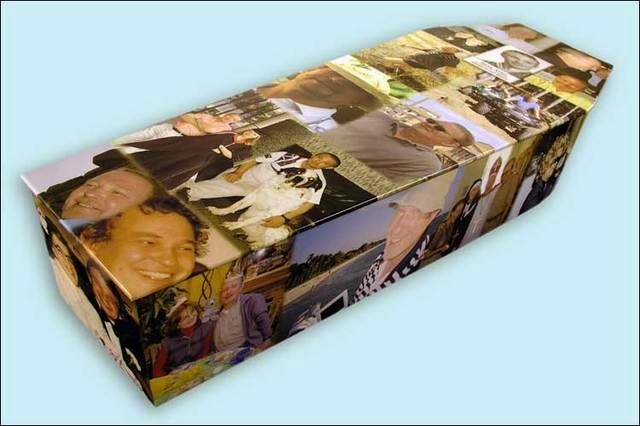 Why go with a boring wood casket when you can have one covered with your favorite photos? Sure, if you have a church burial it will be covered with a funeral pall and it would be a total waste of money but even if you die, Photoshop lives! 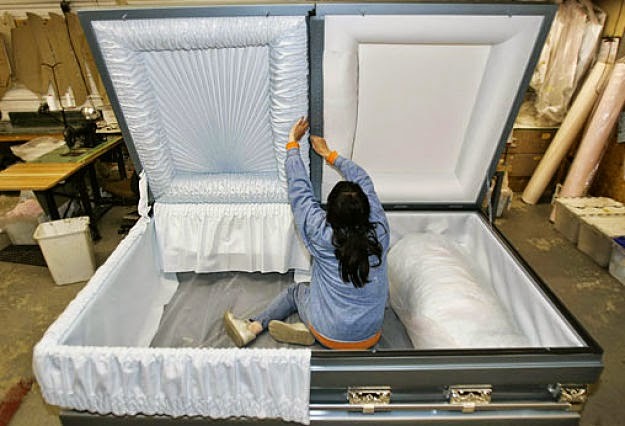 Here's a coffin proffering a vaguely theological statement. It fits in nicely with all of those "she has been called home" cliches that people bandy about during wakes. Plus, if you send it registered mail you have a good chance of getting Jesus' autograph which would go for a considerable sum on eBay. Roll Tide! Now you don't have to be just a life-long fan you can be an eternal life-long fan. 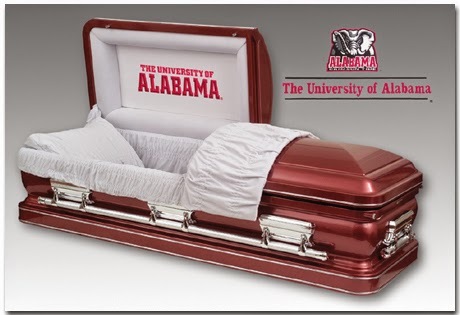 And to think, the money you spend on this coffin could have been wasted by donating it to the university's scholarship fund. (This is also known as the Rev. Laurie Brock Memorial Casket). 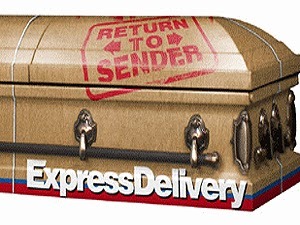 If you're a practical joker who likes to creep out your loved ones, this is perfect. 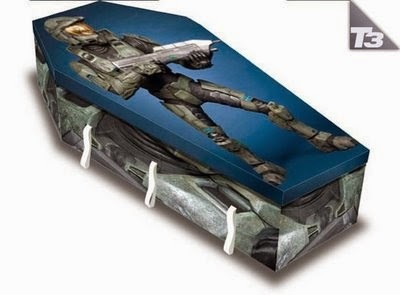 Also if you die on either Halloween or April Fools Day, this is the casket for you. For the skiers among us -- and here in New England there are a LOT of them -- this makes great sense. Of course if you rent your skis, this might prove problematic for your family members who will inherit significantly less money given the cost of ski equipment. If I had a hammer? Pete Seeger would be proud. Or Bob Villa. Or Tim "The Tool Man" Taylor. Imagine what this beauty would do to your thumb? Or maybe it's just a nod to all your friends who will get hammered at the reception. For the gamers among you this is your chance to kill one more zombie. True confession: I thought this was a Star Wars character but my 13-year-old told me it was Master Chief from the game HALO. Also, I don't know if there are zombies in that game. 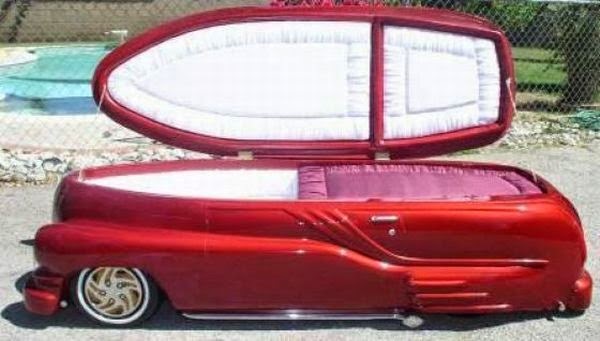 For the hot rod enthusiast or anyone who just wants to speed past purgatory (just kidding, we don't believe in that), this race casket is right up your alley. And, no, it does not come with an optional sun roof. If spending eternity with cheap beer is your idea of heaven, this beauty will do the trick. Creepy drunk guy not included. Do you have a problem disconnecting from your iPhone? 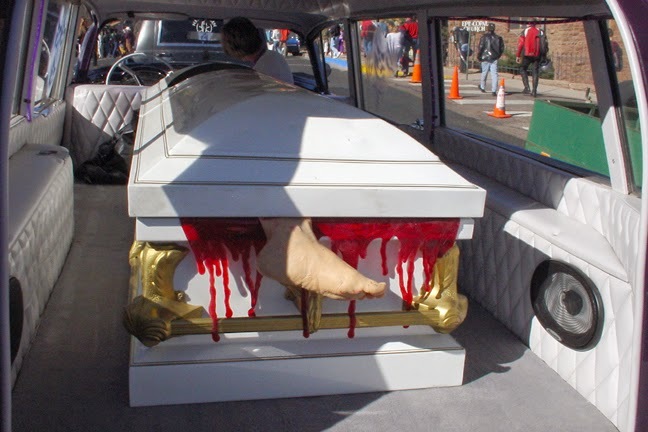 This coffin offers the perfect solution. I'm not sure what you do when you're due for an upgrade. (This is also known as the Rev. 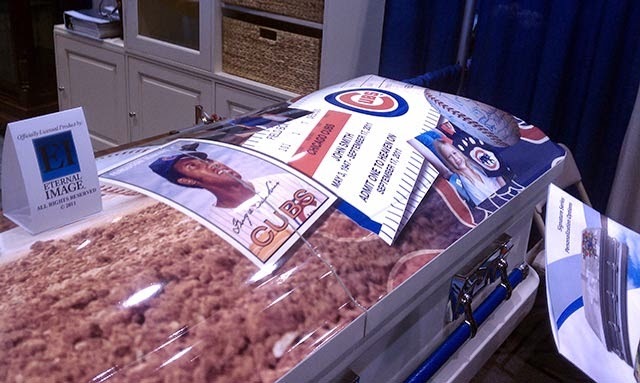 Scott Gunn Memorial Casket). 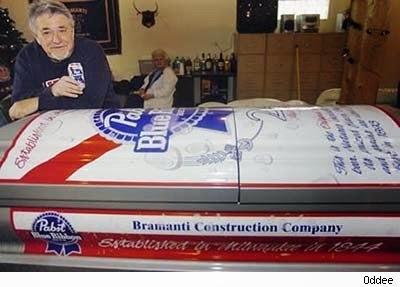 This "double wide" casket is for those who drank too much of that cheap beer while still above ground (see the PBR casket above). It measures four feet by eight feet in case you were wondering. Did your mother always complain about your posture and tell you to "sit up straight?" You'll never have to hear those words again with this one. 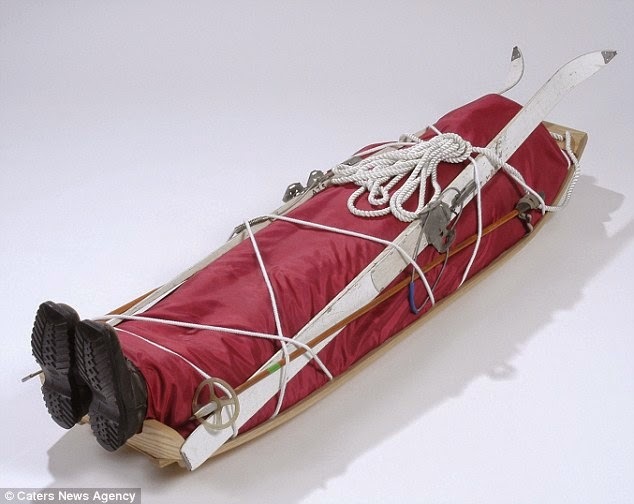 Yes, it looks horribly uncomfortable, even for someone who's dead. As for me? 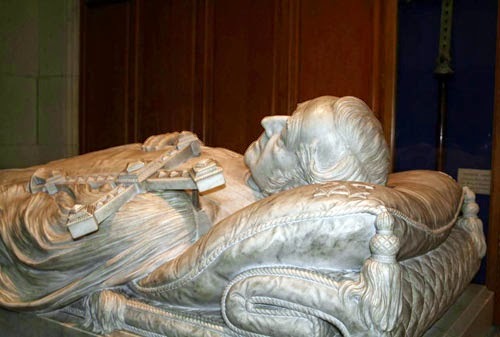 I just want a simple marble sarcophagus placed in the side chapel of a fancy cathedral in Europe. You are a warped twisted man and I have loved your death trifecta. 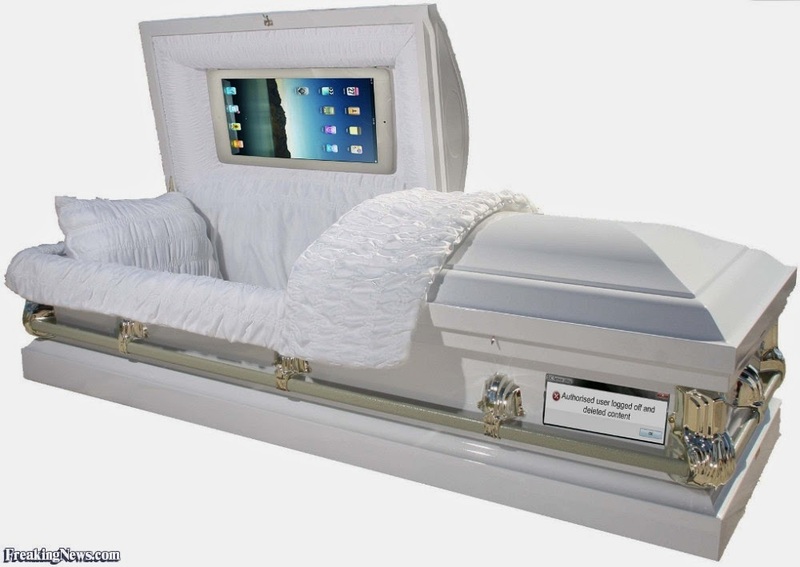 Thank you for the entertaining look at the latest trends in dying. 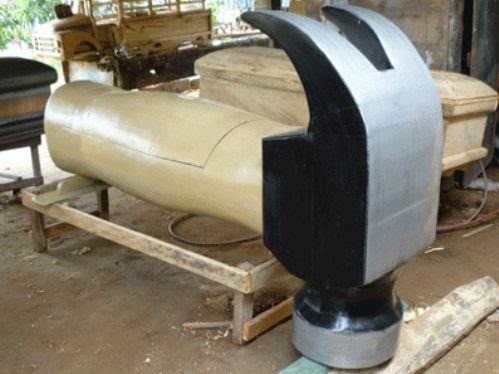 If both my parents weren't interned (completely) in the ground, I'm sure some of these urns and coffins would have started fights among the siblings over which would be most appropriate for our beloved parents. I'm so totally torn between the cremation bullets & the Rev. Scott Gunn Memorial Casket! I'll take the traditional plain pine box with a simple Jewish star on top. Thanks.